King Gambrinus Day Challenge Is On! Donate Now. 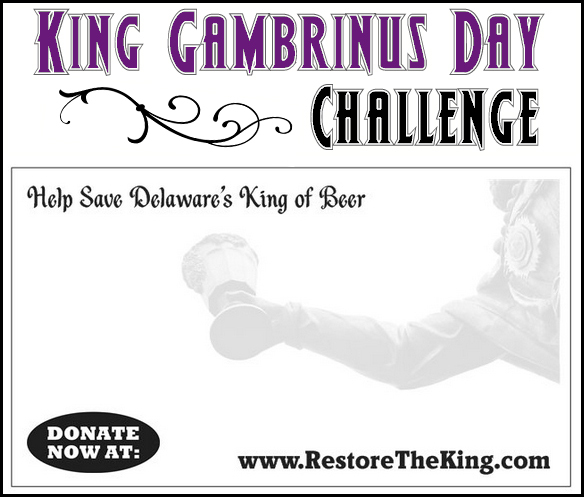 May 15, 2018 — The Friends of Delaware’s Gambrinus Statue (FDGS) offers its gratitude to those who have provided encouragement and kind words of support over the last year for the Restore the King campaign, our effort to save Delaware’s Gambrinus statue. To those who have already contributed, we extend our sincerest thanks. To those who have not yet done so, now is the perfect chance to demonstrate your interest in saving this significant Delaware cultural artifact. This year on April 11, King Gambrinus Day, FDGS received a generous donation from an anonymous source. The donor pledged $5,000 to the campaign, provided we match their donation with an additional $5,000 before April 11, 2019. The King Gambrinus Day Challenge is officially on! We have catalogued the Gambrinus statue’s more than 60 pieces, which remain in safe storage. FDGS will use a portion of the King Gambrinus Day Challenge funds to obtain a 3D laser scan of a similar existing statue. This will help us procure the most accurate bids possible from restoration experts and eventually allow for precise recasting of our statue’s missing and damaged parts. Won’t you help keep the Restore the King project moving rapidly forward with a donation now? We can only meet the King Gambrinus Day Challenge with your financial assistance. Every little bit of support gets us closer to meeting our goal. Click here to help save King Gambrinus. FDGS is a 501(c)(3) tax-exempt organization (EIN# 81-4606921). All or part of your gift to our Restore the King campaign may be tax deductible as a charitable contribution. Please check with your tax advisor.